Acoustic desktop screens are designed to help soak up ambient background noise in offices, classrooms and many other indoor environments. When open plan spaces become particularly crowded, noise levels often rise and this can cause issues with volume levels, which can lead to loss of concentration and a number of other complications. The acoustic desktop screens are designed to help resolve this by introducing soft surfaces equipped with acoustic foam which are designed to soak up sound waves. We manufacture our desktop screens in a range of different designs and each is tailored to enhance the aesthetic of the space, as well as making it more practical. 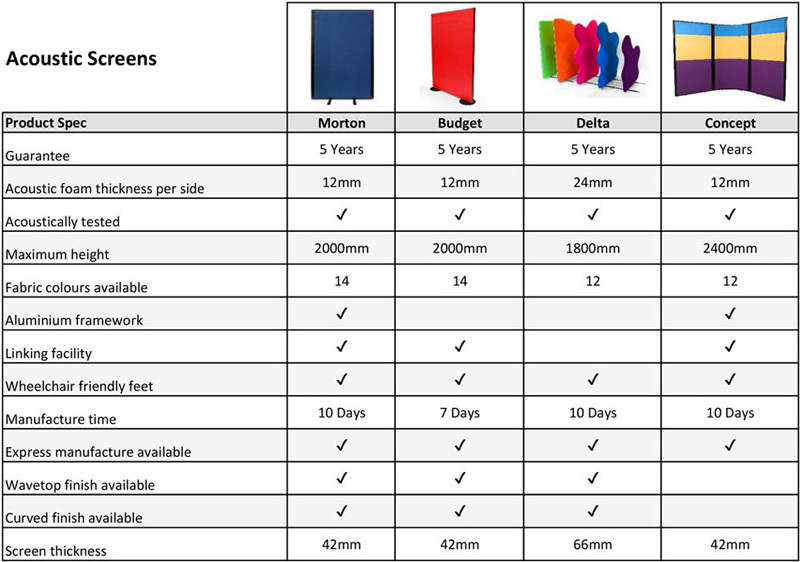 The dividers can be produced in a variety of different shapes and sizes which means they are able to adapt to the design and layout which you have available. Each can be customised with a range of fabric colours to help make the space more vibrant and inviting. All the products that we manufacture are made to order, which means they are created unique to your environment and situation. Because of this, you can create acoustic screens which are tailored to your desk arrangement, ensuring that it adds both practicality and aesthetically to the surroundings. As with all of the products that we create, there is a manufacturer's guarantee included. Our acoustic desktop screens each are composed of a similar design. This is to ensure that each panel is strong and sturdy once it is applied to the desk, but is also highly effective whilst in use. This core is then surrounded with two layers of acoustic foam. While this will never be able to block out sound, it helps significantly with the reverberation in the room and overall reduces the audible distractions which become commonplace in open plan environments. Each order is manufactured on site at our premises in Peterborough, Cambridgeshire. Every divider is checked thoroughly throughout the manufacturing process to ensure our high standards so that when they arrive, they are ready to be installed and put to use. 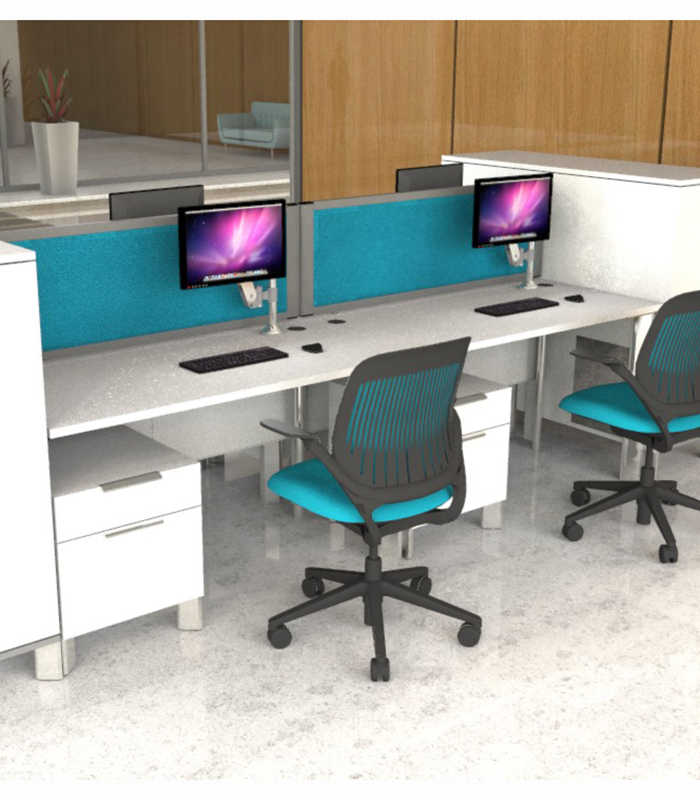 The acoustic desktop screens each feature a clamp which is designed to secure them safely to the desk. The individual items pages provide further information on the acoustic desk dividers and how they are manufactured and there you can look through all of the options which are available. If you have an idea of what you need but are unsure of which acoustic desk divider would be right for you, then please get in touch by calling 01733 394941 or send an e-mail to [email protected].